The Moraya Bay Outdoor Chaise Lunge Chair by Lane Venture at Alison Craig Home Furnishings in the Naples, Fort Myers, Pelican Bay, Pine Ridge, Bonita Spring, Golden Gate, Estero, Cape Coral, Marco Island, Sanibel/Captiva Island, Point Charlotte, Ave Maria, Florida area. Product availability may vary. Contact us for the most current availability on this product. Finish & Paint Options Available only in Tapestry Brown. Construction Hand-woven polyethylene synthetic fiber over a cold drawn premium aluminium frame. Create an outdoor space as fun and comfortable as your indoor living or dining room with pieces from this collection. Create a lounge area with a sofa, loveseat and an accent table or two. This pieces are a great way to upgrade your patio to the ultimate hangout spot. Add a chaise poolside for a comfortable place to soak up the sunshine. And don't forget to create an outdoor dining room where you can enjoy a delicious meal while relaxing outside. 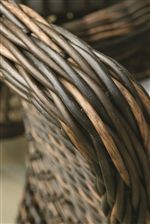 This collection features a warm brown finish and soft curves. The hand-woven synthetic fibers give the pieces their tropical look while being able to last all season long. 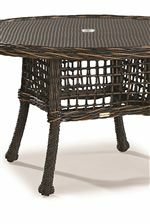 The Moraya Bay collection is a great option if you are looking for Tropical Coastal Outdoor Furniture in the Naples, Fort Myers, Pelican Bay, Pine Ridge, Bonita Spring, Golden Gate, Estero, Cape Coral, Marco Island, Sanibel/Captiva Island, Point Charlotte, Ave Maria, Florida area. Browse other items in the Moraya Bay collection from Alison Craig Home Furnishings in the Naples, Fort Myers, Pelican Bay, Pine Ridge, Bonita Spring, Golden Gate, Estero, Cape Coral, Marco Island, Sanibel/Captiva Island, Point Charlotte, Ave Maria, Florida area.